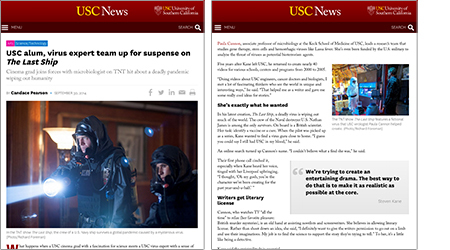 In two stories in USC News, the Ebola crisis is looked at head on -- with an expert take on its DNA and a surprising convergence in pop culture. 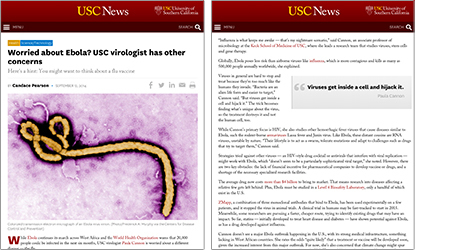 While Ebola continues its march across West Africa and the World Health Organization warns that 20,000 people could be infected in the next six months, USC virologist Paula Cannon is worried about a different disease — the flu. "Influenza is what keeps me awake — that's my nightmare scenario," said Cannon, an associate professor of microbiology at the Keck School of Medicine of USC, where she leads a research team that studies viruses, stem cells and gene therapy. Globally, Ebola poses less risk than airborne viruses like influenza, which is more contagious and kills as many as 500,000 people annually worldwide, she explained. Viruses in general are hard to stop and treat because they're too much like the humans they invade. "Bacteria are an alien life form and easier to target," Cannon said. "But viruses get inside a cell and hijack it." The trick becomes finding what's unique about the virus, so the treatment destroys it and not the human cell, too. What happens when a USC cinema grad with a fascination for science meets a USC virus expert with a sense of drama? A hit TV show about a global pandemic with plenty of scientific cred. The Last Ship — one of summer's big hits and recently renewed by TNT for a second season — was created by Steven Kane MA '95 and his writing partner and co-executive producer Hank Steinberg. Kane, who graduated from the USC School of Cinematic Arts, has gone on to success as a writer-producer with such TV drama credits as The Closer, Major Crimes, Alias and Without a Trace, along with the comedies American Dad and Curb Your Enthusiasm. Paula Cannon, associate professor of microbiology at the Keck School of Medicine of USC, leads a research team that studies gene therapy, stem cells and hemorrhagic viruses like Lassa fever. She's even been funded by the U.S. military to analyze the threat of viruses as potential bioterrorism agents. Five years after Kane left USC, he returned to create nearly 40 videos for various schools, centers and programs from 2000 to 2005. "Doing videos about USC engineers, cancer doctors and biologists, I met a lot of fascinating thinkers who see the world in unique and interesting ways," he said. "That helped me as a writer and gave me some really cool ideas for stories." In his latest creation, The Last Ship, a deadly virus is wiping out much of the world. The crew of the Naval destroyer U.S. Nathan James is among the only survivors. On board is a British scientist. Her task: identify a vaccine or a cure. When the pilot was picked up as a series, Kane wanted to find a virus guru close to home. "I guess you could say I still had USC in my blood," he said.